'OSLO' Tells The Surprising Story Behind A Historic Handshake A new play chronicles the secret negotiations that brokered the 1993 Palestinian-Israeli peace accord. It's a thriller, says playwright J.T. Rogers: "The ticking clock is the dramatist's friend." Israeli Prime Minister Yitzhak Rabin (left) and Palestine Liberation Organization Chairman Yasser Arafat (right) shake hands at the White House in front of President Bill Clinton in September 1993. The new play OSLO is a dramatization of events that led to a historic agreement. 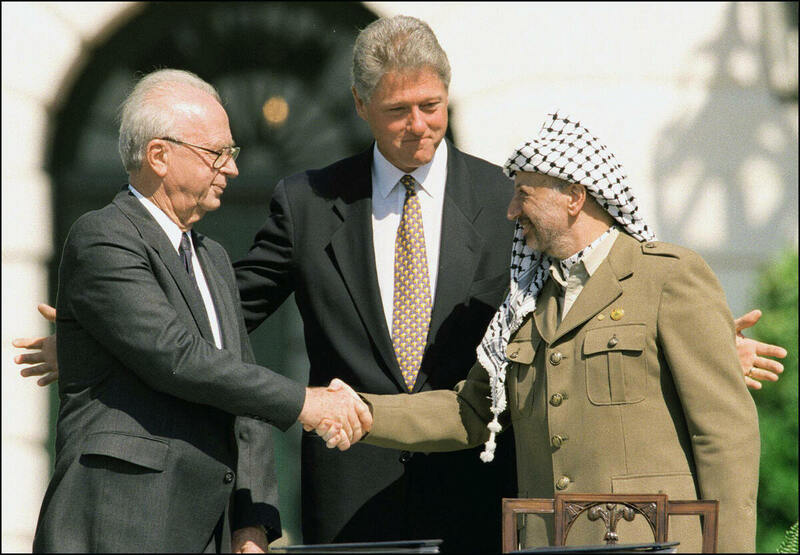 In September 1993, Israeli Prime Minister Yitzhak Rabin and Palestine Liberation Organization Chairman Yasser Arafat shook hands on the White House lawn. It was an iconic moment — two mortal enemies had come to terms on a historic peace agreement. That agreement was forged during months of secret back-channel talks in Norway. A new off-Broadway play, OSLO, looks at this little-known part of the peace process. The most important piece of scenery in OSLO is a door: On one side, the negotiations; on the other, a husband and wife who never cross the threshold. "You enter the story through their human point of view ..." says director Bartlett Sher. "They're your entry point." The idea for the negotiations came from the couple — Terje Rød-Larsen was a sociologist and academic, Mona Juul was a young foreign service officer. She had been posted to Cairo, where they got to know people on both sides of the conflict. Jennifer Ehle and Jefferson Mays star as Mona Juul and Terje Rød-Larsen. The secret 1993 peace talks in Norway were their idea. When official talks between the parties in Washington, D.C., stalled, the couple arranged for both parties to meet secretly in Norway without the initial approval of their government. It was "exactly the opposite way of what was done in Washington," explains Rød-Larsen, now president of the International Peace Institute. "We did not put proposals on the table. We said we would facilitate, bring the parties together, be go-between, assist them in any way, saying: It's your problem, you have to resolve it yourself. We don't want to push anything on you." To focus on trust and personal relationships, the delegations could only have three people per side, Rød-Larsen explains. They lived in the same house, ate every meal together, and took breaks together. "They had to live together," Rød-Larsen says. The sociologist was testing a theory, but playwright J.T. Rogers says the story behind OSLO is anything but a dry, academic treatise. "It was very clear that it was a thriller, because it was — the ticking clock is the dramatist's friend," Rogers says. 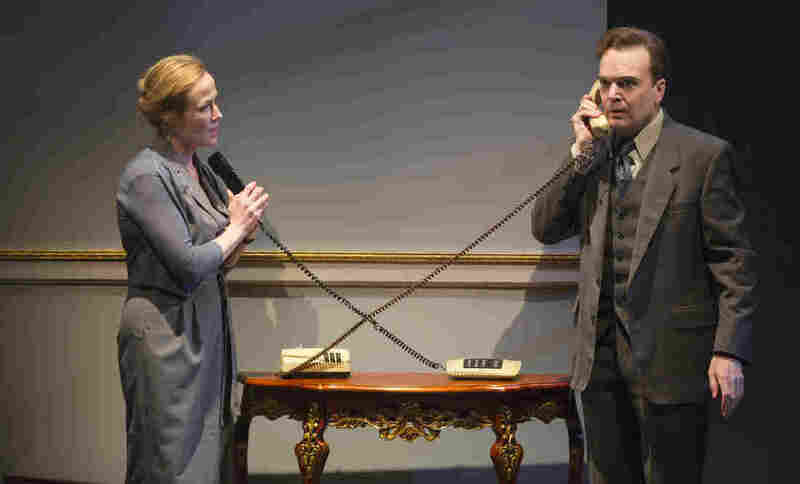 The actors who play the Norwegian couple, Jennifer Ehle and Jefferson Mays, say it feels like a thriller every night. "We are continually surprised by this play; the doing of it," Mays says. "It feels like an ambush. We never know exactly what's going on or ... what's coming next. I have a copy of my script backstage at all times that I continually refer to." "I have little cheat sheets in my pocket that tell me what's coming next," Ehle adds. Mays says the play feels like "a wild improvisation." OSLO is based, in part, on extensive interviews playwright J.T. Rogers did with Rød-Larsen and Juul. He wanted to explore the intersection of the personal with the political. "The hope was to make a political play in the Greek sense of that word — a play about the public and the larger ideas about who we are, as human beings and as nations," Rogers says. "How do we go forward and how do we live, with our enemies and with ourselves?" Director Bartlett Sher is glad OSLO depicts history in all its complexity, rather than a "Hollywood version of how this great thing was accomplished." Sher says both he and Rogers felt they couldn't show the script to the couple ahead of time. Juul — who's the current Norwegian ambassador to the U.K. — hasn't seen the play yet, but Rød-Larsen has. "This is not a documentary, so many of the scenes there never took place or took place in a different way ..." Rød-Larsen says. But, he believes the playwright, the director and the actors have captured the spirit of Oslo "tremendously well." Sometimes the impossible is easier to do than the possible. It was a spirit of optimism, Rød-Larsen says; Oslo was all about bringing the right tools and handling those tools properly. Even when problems seem unsolvable, he believes there are solutions. "Sometimes the impossible is easier to do than the possible," Rød-Larsen says. "If you have resilience and are persistent, you can do things that nobody believes." Critics and audiences have responded to that message; the off-Broadway run at Lincoln Center is sold-out and it was just announced that OSLO will move to Broadway next spring.